Forty-eight hours later, what should we think about the administration's announcement of more help for people with underwater mortgages? To be honest, I'm still not sure. And that's partly because even the experts I trust seem to disagree. Just to review, the Obama Administration’s record on helping distressed homeowners is pretty shoddy, as even the Obama himself now admits. He came into office promising relief for homeowners with mortgages they could no longer afford, but his policies delivered very little of it. The administration had at its disposal $50 billion in money, which it eventually allocated to the Home Affordable Modification Program (HAMP) Congress had approved for rescuing the financial sector. But it ended up distributing only a fraction of that money, as stories from ProPublica and more recently the Washington Post have made clear. Meanwhile, plenty of people are still struggling to make their mortgage payments. In many cases, they are in trouble largely because they’ve lost their jobs. They can neither sell nor refinance, despite record low rates, because their mortgages are "underwater" – that is, the values have fallen so far that they are worth less than the mortgages themselves. Many are also victims of unethical, if not downright illegal, practices by banks. Whatever the combination of causes, their difficulties are having a ripple effect on the economy, since people who can barely make their mortgage payments (or, worse still, cannot make them at all) can’t spend money on other things. You can make a case that the best way to help these people would be to strengthen the economy – creating jobs, lifting wages – so they have more money at their disposal. And the administration, to its credit, is still pushing for its jobs bill, one piece at a time. But with congressional action still unlikely, the administration is also seeking ways to act on its own, even if those initiatives are bound to be pretty limited. That's what Monday's announcement was all about. Two years ago, the administration started the Home Affordable Refinancing Program, or HARP, which is not to be confused with HAMP. It allowed people with little or no equity to refinance their mortgages, thus taking advantage of low rates, if their mortgage was owned by Fannie or Freddie Mac. But HARP had other restrictions: If, for example, your mortgage was worth more than 25 percent of your house value, you couldn't be part of the program. That eliminated a lot of people whose mortgages were even deeper underwater. Now, thanks to clearance from the the Federal Housing Finance Agency (FHFA), which oversees Fannie and Freddie, more people can use the program and get those low refinancing rates. Not everybody feels the same way. Zach Carter raised one major objection in Huffington Post on Monday: That it will let the banks off easy, by effectively transferring financial liability for these refinanced loans from the banks to taxpayers. If they still end up in default, the government will basically have to eat the cost. Adam Levitin, a Georgetown law professor, was also unimpressed. He’d like to see the administration to push FHFA harder – so that the federal government help more homeowners, including those in more danger of truly losing their homes, perhaps by actually reducing the amount of principal that people owe. 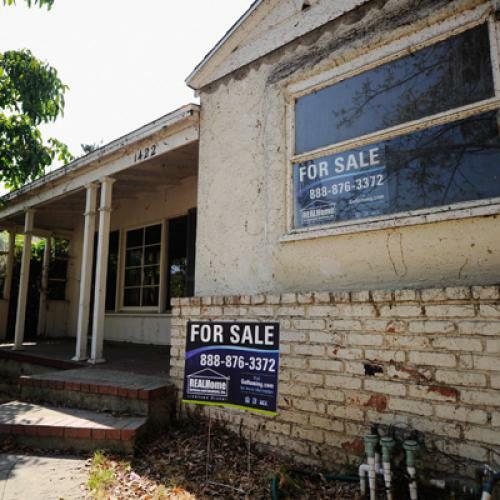 “There are plenty of bolder steps the Administration could take, but it simply lacks the political will to respond to the housing market with a solution of appropriate scope and magnitude. “ Later he emailed with a blunter take: “The plan amounts to bupkis." the fundamental problem in housing markets is that we’ve got an oversupply of homes that traditionally would be occupied by owners. To fix that you could try to raise demand by encouraging more people to get into the market, but that would be hard given the weak labor market and still-tight financing conditions. Alternatively, you could reduce supply by moving some of those homes to the rental market. Fannie and Freddie should be able to do more to encourage this. For example, they could lift the restrictions on how many properties an investor can own and still qualify for a F/F loan. Or, they could sell the foreclosed-upon properties they own in bulk to investors who agree to rent. One of the most effective strategies for foreclosure mitigation has been mandatory mediation, a drum the Center for American Progress has been beating since 2009. Getting the borrower and the lender in a room together before any foreclosure action is taken actually works in reaching a settlement. Cities like Philadelphia and states like Connecticut have seen excellent results, saving people from foreclosure. If all the HAMP money were put toward mandatory mediation, borrowers would be in a much better place. But mandatory mediation is under attack, probably because it works too well. Florida wants to kill it. There are ways that the Administration can design grants that threaten other funds to the states if the mandatory mediation programs aren’t picked up. To repeat what I said the other day, I really don’t feel qualified to offer a strong opinion of what's worthwhile and what isn't. But with the economy in such trouble, and so many homeowners struggling with high mortgages, my instinct is to err on the side of doing more, not less -- and trying anything with promise, even if the potential benefits are modest. Remember, if high mortgage payments mean more foreclosures and a slower economy, we all suffer. Update: I added a line at the very end, reminding readers that this isn't just about the people with underwater mortgages. My thanks to reader "rayward" for that very good suggestion. I also modified the wording in a few places, just to clarify the definition of "underwater" mortgages.